Google Alerts is a free service that sends you email as and when something of interest takes place on the Internet on a topic which is being monitored by you and which appears newly in Google results. You can monitor developments on the Internet about your own personal name, any developing news story, latest news about any celebrity or almost anything on the Internet. 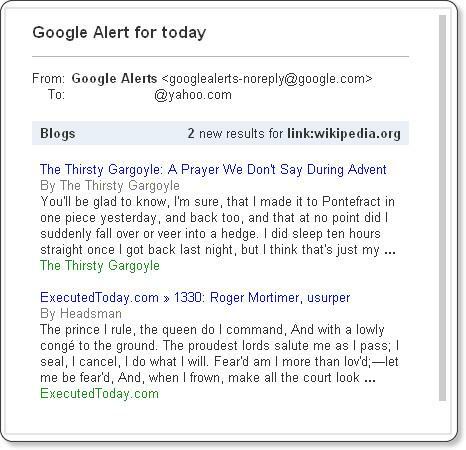 If you own a website or a blog, you can even use Google Alerts to update you by email as and when somebody links to your website. Thus, in this manner you can monitor new backlinks to your website. (3) Now, click Create Alert button. 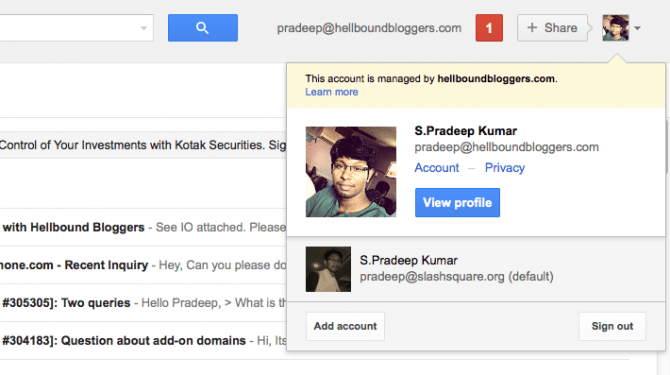 You’ll get the success message informing you that Google Alert was Created. It will also inform you that a verification email has been sent to your designated email address and that you “will not receive Google Alerts on this topic until you click the link in the verification email and confirm your request”. So, check you email account and in the email received from Google Alerts, verify the Google Alerts request by clicking the link. This email also contains the link to cancel this particular Google Alert if you decide to cancel it in future. That’s it! Now your Google Alert has been set up. Now onwards, whenever people link to your website, and when that link gets indexed by Google, you’ll get an email update from Google Alert. Please note that creating a Google Alert does not required you to login with your Google Account; what you require is merely any email address. However, if you use your Google Account and sign in to Google Alert with it, you’ll be in a position to better manage all your Google Alerts. It may be noted that you’ll get the email update only when Google has indexed the web page that has linked to your website. However, as you’re aware Google is quite fast in indexing web pages. So, usually, you should get the email update of new links to your site on the same day or may be next day. 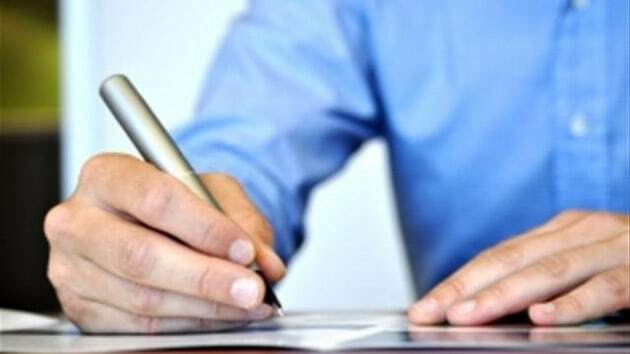 Ashok writes regularly on tech-related matters at TekGazet. You can follow him at Twitter: @tekgazet; and at Facebook: Tekgazet at Facebook. I use alerts to get new, relevant, high pr backlinks for my websites. It really is a fantastic tool! I guess we can also use this to track where our name is mentioned (as long as its unique) on the web… But this one is interesting. Should be useful to people who want to monitor back-links to their site… But trying to follow a generic topic, doesn't result in targeted results with GAL. 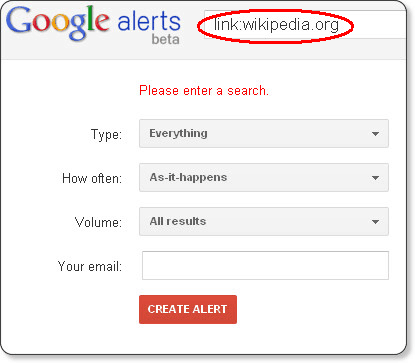 Google Alerts is very useful for many purposes like to get certain informatioin, spying your competitors and so on. And here is another great feature mentioned in this article. No doubt in that this tool will help for us lot because in my point of view this is one of the great tool to touch with many bloggers. I just created google alert to monitor the backlinks for one of my site. If it works then it would be really one great features by google to monitor backlinks. After closing of yahoo site explorer now webmasters like us getting problem to observer the backlinks. My another question is that will google alert show the pages with anchored backlink also? Since Google indexes the raw HTML code of a web pages, Google Alert would show you anchored backlinks also. omg! realy realy great post Ashok. thanks for sharing with us. Ayush, when I checked normal Google Search for link:itechboy.net, I did not find even a single search result. Therefore, Google does not have even a single backlinks for your site in its index. It happens sometimes, especially for comparatively new sites. Google will generally show you less backlinks than you actually have. Earlier, Google was infamous for concealing backlinks; people suspected that it deliberately did it so that one cannot make a guess of how Google rates your site (it is well known that backlinks are given good weightage in calculation of PageRank). Now, Google has improved a lot in this regard. More so, if you sign in to Google Webmaster Tools for your site (and confirm that it is your site as per its procedure), you get much better results for your backlinks. Yahoo Site Builder was the best site for checking backlinks. But, I am sorry to say that just 10 days back Yahoo Site Builder website has been closed since Yahoo Search is merging with Bing Search. But Bing Webmaster Tools is not as effective as Yahoo Site Builder was. Therefore, there is nothing unusual if you don't any results with Google Alerts for links for your site, since Google is yet to index your backlinks (at least in public, it is not disclosing at this stage, even at Google search). Yahoo Site Builder? – You mean Yahoo Site Explorer? Yahoo Site Explorer is where you can check a website's backlinks just like Google Webmasters Tools. But is was now shut by Yahoo. GWT has improved a lot. It is now showing more links than before. But when I typed my blog's URL on the Google Alerts, I see only 7 results. Why is that happening? Google says I have 278 pages indexed already. Thanks for pointing out. It is Yahoo Site Explorer and not Yahoo Site Builder. My apologies for typo mistake. It closed down 10 days back (on 21 Nov 2011). As I wrote in my reply to Ayush, since Google Alert picks up backlinks from Google Search, and since Google Search itself does not show all backlinks deliberately, therefore, you'll notice less backlinks from Google Alerts. 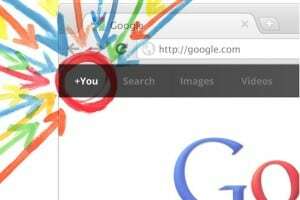 This fact can be confirmed by conducting same link search on Google Search. Of course, Google Webmaster Tool has now improved a lot and it shows much better number of backlinks. You're right. As I mentioned earlier, Google deliberately does not show all backlinks in public. At least this used to be case earlier. But, for older and bigger sites, backlinks are updated immediately. For a smaller and/or newer site, it does not show full backlinks or does not show any backlinks at all, when you may be having a large number of backlinks. There are many conspiracy theories on Internet why Google does not deliberately show (in public) backlinks. You may notice that in all other respects, Google is the fastest in indexing. It has latest backlinks for every site; but holds back them at least partially for the smaller and newer sites. This problem is not seen to that extent for older / bigger sites. For them, the indexing is almost instantaneous. The reason (perhaps) is that you can easily measure a bucket full of water, but you can't measure an ocean-full of water. So, (perhaps) Google feels that by disclosing its backlinks for smaller sites, one can form a guess how that site is ranked. 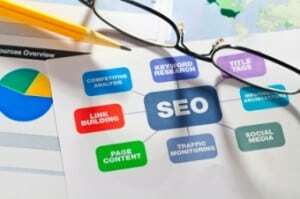 But, for a bigger site, with tens of thousands (or millions) of backlinks, it would be difficult to guess its ranking on the basis of backlinks. It basically does not want to (publically) disclose many backlinks. That's why you see backlinks in Google Webmaster Tools, but you won't see them when you search in Google. Therefore, this problem is not unique to your site, but is quite common problem for other sites also, more so if your site is newer and smaller. Thanks, this seems a great way to keep track of the backlinks.Useful tip for all the bloggers. I never though that we can check about our backlinks through Google Alerts, that's really interesting and informative article. I copy on Aarti ! Never knew this kind , nice work Ashok ! Though I am using Google Alerts for getting other alerts, I never knew about this. Thanks for this info Ashok. Nice post for newbie's who still haven't taken advantage of this great Google tool.